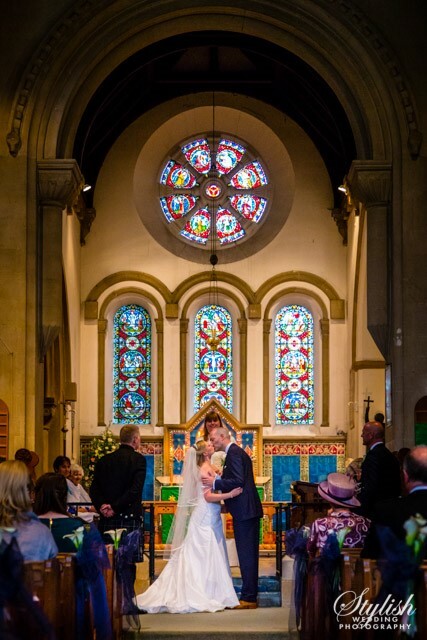 My fiancée and I have always wanted to have a church wedding, but it had to be somewhere that meant something to us personally, and with me having grown up in Farnham, and been a regular at St John’s for many years, it made complete sense to have our wedding at St John’s. After meeting Lesley and seeing how friendly and welcoming the congregation are, we were certain this was the place where we should start our married lives together. Lesley was incredibly supportive and accommodating throughout, in terms of allowing access for our Photographer and Florist, in helping in our choice of readings and selection of hymns, we couldn’t have asked for anything more. A our rehearsal, Lesley made every effort to make all involved feel as relaxed as possible, and really left us with a feeling of confidence that everything was ‘under control’. The big day came at last, and it even stopped raining just at the perfect moment..
Our service was formal, personal, emotional and heartfelt all at the same time, and this was just the perfect balance for us, our families and guests. In fact, many people commented on how lovely the service was and how, unlike at other weddings no-one wanted to ‘rush off to the reception’ but really take the time to soak up the atmosphere and to realise the importance and full impact of the wedding service itself. Lesley’s address was funny, sincere and even included reminiscences from my time at the Church 25 years ago! It was great to see how the congregation supported us at the wedding and this really added to how special our day felt. With great accompaniment from the choir and organist, we all left the church with feelings of elation and optimism about our future together.